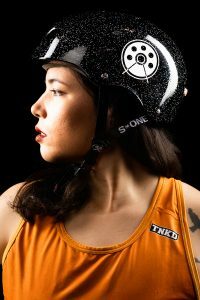 Derby crush (who inspires you and why): I am inspired and motivated by London, Stockholm, Helsinki or Berlin. And then there’s Scald Eagle… or Demanda Riot… oh, the list goes on forever! Too many great women! But my real derby crush goes out to my team <3 ! Favorite Bout preparation song: BEYONCE. Peaches is good as well (“BURST!”, “Kick it”, “Hit it Hard”, “Show Stopper”)… or anything that makes me feel fireworks inside! Best Derby moment: When leaving your comfort zone and the hard work of blood sweat and tears pays off in the feeling you get when you see that teamplay works out non-verbally and we just function together like a machinery. The right mindset at the right time.